Before beginning the first year of the two-year, full-time MBA program at the AASCB-accredited Kelley School of Business, students participate in the two-week intensive Me Inc. program, which fosters team building elements and career development. Those without an undergraduate business degree can also participate in the Jump Start week, helping those get up to speed alongside their peers. Alongside the academic regiment, students in the Kelly full-time program participate in coinciding leadership and career development from the very beginning until the very end of the program, with rigorous career coaching, networking assistance, a summer internship, and much more. Alongside 15 weeks of core courses, first year students select one of seven “academies,” of which include: business marketing; capital markets; consulting; consumer marketing; strategic finance; supply chain; and PLUS life sciences. Academies in the second year of the program are optional, but can help students accentuate the learning experiences of the first year. In the second semester, students begin integrating electives to their coursework, which lasts until the fourth and final semester. The final semester features an optional study abroad segment, a study week in Washington DC, and the final capstone project requirement. 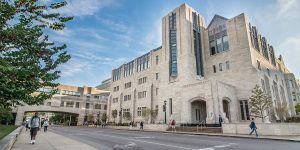 The University of Indiana Kelley School of Business Class of 2019 features 204 total students, 29 percent of which are women, 25 percent are U.S. underrepresented minority students, and 30 percent international students. The average age of the class is 28, ranging between 22-40-years old. The average span of work experience prior to enrollment is five years. The undergraduate GPA of the class was 3.38 and the GMAT was 677. Recent Kelley full-time MBA graduates earned an average post-grad salary of $107,000 per year, with a $25,000 signing bonus, and $16,000 in other guaranteed finance compensation. The majority of grads entered marketing careers (32 percent), followed by consulting (24 percent), and finance (21 percent). Merit-based aids are awarded automatically as part of the admissions process and do not require any extra application processes. More than half of enrolled students earn some form of scholarship assistance, which can range from $10,000 to the entire cost of tuition. Additional fellowships are also available, including Forté Fellowships and Kelley School of Business Merit Fellowship, among others. U.S. students are eligible for both public and private loans, while international students are generally offered private loans. Interviews are not required, but are encouraged as part of the admissions process.